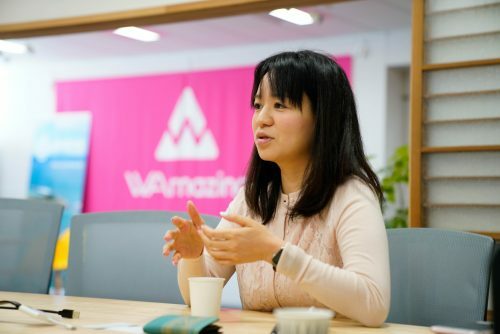 Fumiko Kato, CEO of WAmazing, is one of the speakers of Slush Tokyo 2018. WAmazing provides a free network service for the tourists coming to Japan. Since she founded WAmazing in 2016, the highly qualified system has been evaluated and the application has more than 80,000 downloads. Now, the service is opened only to tourists from Taiwan and Hong Kong but it will be expanded now on. Q1 You worked at a major enterprise and you decided to get out on your own. What lead you to start a new business? I was working on tourist service at that time, I came to know that many tourists coming to Japan feel the inconvenience to network service because there’s less Free Wifi in the town. Having little interest in that topic I started to study about telecommunication industry. At the same time, the Japanese government took a new policy which encourages MVNO, Mobile virtual network operator system. I started to consider new network service for foreigners and noticed that I can not challenge this in where I was at. No one had paid attention to the network for foreigners, so I thought it was the right timing to challenge this service so I decided to start a business. Q2 You have been working on tourism for a long time but why is tourism so attractive to you? I have been working on tourism focused on Japan for about 20 years and there are mainly three reasons, first, it is because tourism industry matches with Internet-based service. For the next reason, tourism is opened to everyone. Anyone can be a consumer. Lastly, it is because I love Japan. Depopulation and aging in rural areas are a severe problem in Japan today and I think tourism is the best way to solve this. It is because tourism has a power to revitalize regional economies. These are the reason why I am so into tourism. Q3 What is your next challenge? Our next challenge is to make our service better known. We have set up our SIM card exchanging machine to nearly all airports which operate international airlines in Japan. Also, 80,000 people downloaded our apps and we made this effort by using an organic share. We have experienced that people tend to share information easily when they received good service for free. However, 80,000 downloads are not enough for us. It is only 1.3% of the target tourists. So our next challenge is to make more WAmazing famous and make the service well known. Q4 What do you expect from Slush Tokyo 2018? I am looking forward to wonderful encounters. Since we have worked mainly in Japan, we didn’t yet have a chance to contact internationally. I think Slush Tokyo 2018 will be a great chance to expand our business in Asia and Globally. I am very excited to join and want to share WAmazing’s vision and see how we could develop our service. Learn more about Slush Tokyo 2018 speaker line-up and get your tickets here! Makoto Fujisaka is a student in Japan. She is interested in Journalism and mass communications. Investments in Southeast Asia: Where is Japan? Slush Tokyo 2019 Pitching Contest Winner Is Clarity K.K. WANNA BE OUR PEN PAL? Receive the latest news and tips to your inbox once in a while. Subscribe to our newsletter to know about our ticket sales! We collect cookies to make your experience here smoother.